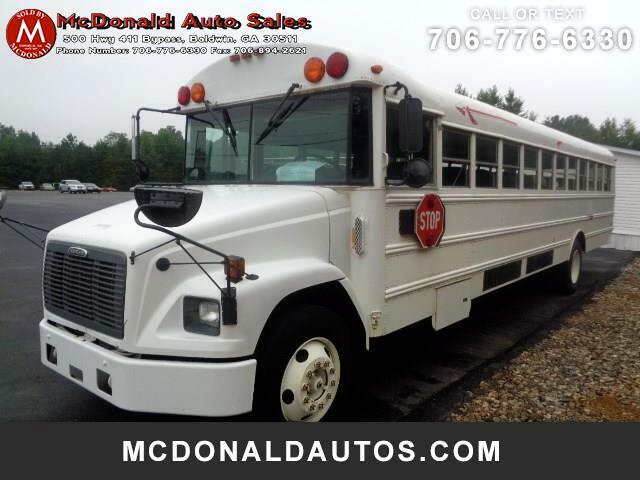 THIS IS A 2002 FREIGHTLINER THOMAS BUILT BUS (48 PASSENGER PLUS DRIVER) WITH A CUMMINS DIESEL ENGINE. IT WAS IN SERVICE AT A PRIVATE SCHOOL AND ROAD CERTIFIED UNTIL EARLIER THIS YEAR. IT RUNS AND DRIVES GREAT, AND WAS JUST DRIVEN 250 MILES WHEN WE PICKED IT UP AFTER IT WAS TRADED ON A NEW BUS. IT HAS 2 CARRIER AIR CONDITIONING UNITS - ONE AT THE REAR AND ONE AT THE FRONT RIGHT SIDE. THEY WERE INSTALLED IN 2011, AND BOTH BLOW ICE COLD AIR. THE TIRES ARE ALL GOOD TREAD AND DO NOT SHOW ANY SIGNS OF DRY ROT. EVERYTHING ON THE BUS APPEARS TO BE IN WORKING ORDER. Message: Thought you might be interested in this 2002 Freightliner FS65.